Adam Michael has this to say “The aroma of nutmeg absolute is soft, warm, spiced, sweet, slightly woody and powdery throughout. I would describe this as a heart note and the most suitable nutmeg material for perfumery work as it alcohol soluble of course but maybe more importantly it does not deposit the resinous substances that need to be filtered out over time, a problem with the essential oil and especially the co2 extract plus the aroma of this absolute is nothing short of dreamy. Oh… WOW! This Nutmeg Absolute just blows my mind! 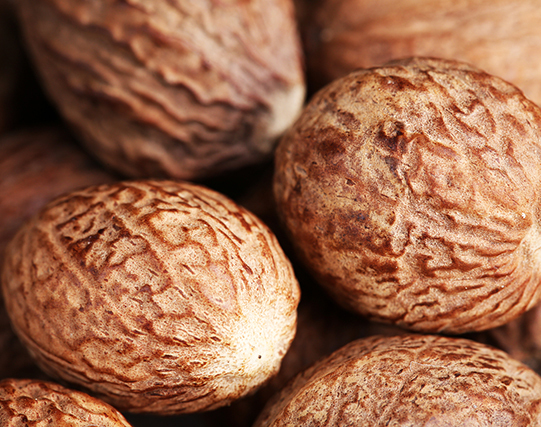 It is far superior than the average Nutmeg absolute from India. I am comparing both side by side at this moment on a strip and on my skin. Even at 5% dilution this is still a spicy kick to the face! It the best way… In comparison to Nutmeg (regular) from India VS. Nutmeg Absolute from India it is far creamier, finer, more powdery than Nutmeg (regular). It also has smoother edges whilst still providing a hardy “wood” aspect to it’s character. It goes SMASHINGLY well with tobacco and amber accords. Paired with Orris Butter 15% it cannot be beat. Way to go Adam & Hermitage!